A senior Kenyan customs officer has described his graduation from CSU as one of his greatest moments ever. 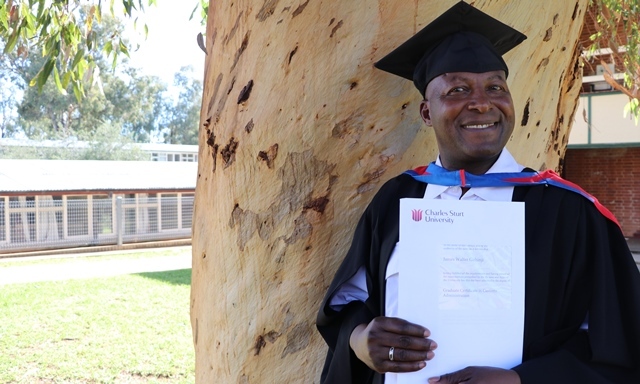 A senior Kenyan customs officer has described his graduation from Charles Sturt University (CSU) as one of his greatest moments ever. So impressed was Mr James Githinji with his graduation ceremony last month and his experience with CSU online, he is continuing his education journey at the University in 2018. Mr Githinji made the lengthy journey from the western Kenyan city of Eldoret to Wagga Wagga in regional Australia to receive a Graduate Certificate in Customs Administration from the University on Monday 11 December. A Regional Manager with Kenya’s Customs and Border Control in the Rift Valley Region near the Ugandan border, Mr Githinji said, “It (graduation) was an achievement I had yearned for, for a very long time. “It made me feel a completely different person. In addition to increasing his skills and opening up career opportunities through higher education, the customs officer also hopes to share his newly acquired knowledge by conducting part-time presentations for his colleagues and the local business community. Mr Githinji is not resting on his laurels. He is continuing his postgraduate studies at CSU in 2018 by enrolling in Graduate Diploma in Customs Administration through the University’s Centre for Customs and Excise Studies. “I took time to search for an appropriate institution which would offer the courses which are relevant to my career. Among the institutions I came across, Charles Sturt University offered the best package in terms of the courses, subjects and the mode of study that suited my needs. “I also discovered that Charles Sturt University is among the institutions recognized by the World Customs Organization, which is the international body that ‘enhances the effectiveness and efficiency of Customs administrations’. “I would wish to advise prospective Charles Sturt University students considering studying CSU online to go for it with a lot of faith and determination. “All one needs is a laptop or PC with reliable internet connectivity. I used a very small portable modem. Needless to say, one also needs to set aside some study time. “Navigating the CSU online platforms is quite easy for any computer literate student. The subject outlines are provided well in advance, giving students a head-start in planning one's study time. “There is also assistance all over from Charles Sturt University staff including for students who may face financial difficulties. “All I can say is that, ‘It is only difficult for those who have not started...’”, Mr Githinji said. For queries contact CSU Media at news@csu.edu.au.